It's no secret that Charleston has made the top of the list time and again as a great place to visit. What with our hospitality, history, and charm (among other things), that should come as no surprise. But would you be surprised to learn that the earliest efforts to draw tourists to the area actually revolved around colorful carousels and Ferris wheels? Read on about how the Isle of Palms got its start as the "Coney Island of the South"! According to local historian Suzannah Smith Miles in her book, The Islands: Sullivan's Island and Isle of Palms, An Illustrated History, Dr. Joseph S. Lawrence was a Beaufort-born soldier who fought in the Confederate War before heading up north to hone his business acumen. In 1896, he came to Charleston with financial backing from wealthy northerners to look for potential investments that could help grow the depressed economy here. Keep in mind that the area was both economically as well as physically devastated at the time, by the War and Reconstruction, as well as from natural disasters such as fire, cyclones, and the earthquake. Dr. Lawrence was taken by boat to what was then known as Long Island (formerly Hunting Island) by local elite and James Island planter W. Wallace Lawton, who had spent childhood days hunting and fishing on the undeveloped island that was now for sale. Dr. Lawrence saw the potential of the wild island as a premier island resort and immediately began the immense undertaking of not only establishing the resort, but most importantly building a safe and reliable transportation system to get visitors there. Seashore Railroad trolley car on Sullivan's Island, ca. 1899. Photo SCE&G. The Long Island Development Company bought Long Island in November, 1897 and shortly renamed it the more euphonious Isle of Palms (sometimes pronounced Isle of Parm, depending on where one was from). 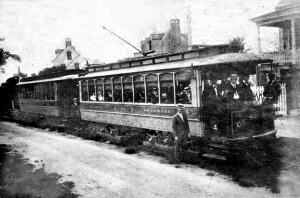 Dr. Lawrence, along with others, had already established the Consolidated Railway, Gas, & Electric Company and created a city-wide electric streetcar system. 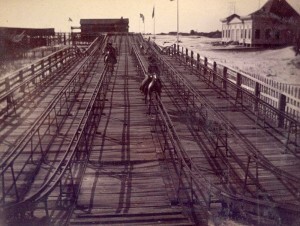 They subsequently created an offshoot called the Charleston and Seashore Railroad Company to build a line that ran from Mt. Pleasant over Cove Inlet to Sullivan's Island, down the length of Sullivan's Island over Breach Inlet and into the Isle of Palms. That a railroad company should build or buy a park at the end of its lines was popular in large American cities at the end of the 19th century, and they typically grew from picnic spots to include regular entertainment, dance halls, and mechanical entertainment. Pretty soon, electric trolley lines were going to seaside resorts like Atlantic City and Coney Island, where dedicated amusement parks were built alongside popular bathing spots. Striking while the iron was hot, it took less than six months for Dr. Lawrence's consortium to construct a state-of-the-art electric trolley line that included two trestle bridges, institute a new ferry service from Charleston to Mt. Pleasant, build new roads on the Isle of Palms, as well as a dance pavilion, bathhouses, and boardwalks; a grand hotel was already under construction by the time the resort opened on July 27, 1898 and mechanical amusement was just around the corner. What excitement! 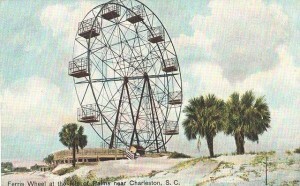 Early postcard of the Ferris wheel on the Isle of Palms, erected in 1898. The resort was a resounding success, with the Seashore Railroad porting 60,000 passengers to and from the island in just the first month after opening. Can you imagine that? Isle of Palms was quickly recognized as one of the best resorts on the east coast, but Dr. Lawrence knew that to continue to compete with the likes of Coney Island and Atlantic City he would need to provide additional amusements, preferably those mechanical in nature. The original Ferris wheel was erected in the medway as a special attraction for the Chicago World's Fair (1893) and was readily replicated for use in other amusement parks. Folklore has it that this original Ferris wheel was the one bought by Dr. Lawrence and rebuilt on Isle of Palms, but this has proved to be a myth (oh, well). The Isle of Palms Ferris wheel came from Atlantic City and was appropriately sized for the island at 120 feet in diameter with 12 cars. It was lit by more than five hundred lights and could be seen from the harbor as well as the city. What a sight that must have been! Gravity Steeplechase Racecourse on Isle of Palms, ca. 1901, Charleston Museum. The News & Courier ran this headline in October, 1898 to announce the amusements coming shortly to the Isle of Palms, including an electric carousel and a steeplechase purchased from Coney Island. 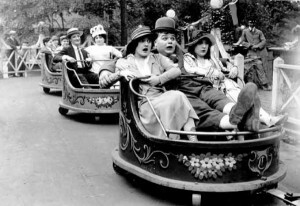 Electric carousels were coming into their heyday, but the Gravity Steeplechase was quite the novel thrill. Did y'all know about these? Attributed to Coney Island's George Tilyou, the mechanical horserace was meant to capitalize on the popularity of horse racing at the time; indeed, it was so lucrative at Coney Island the ride was referred to as "The Mint." Riders mounted life-sized 500-pound mechanical horses that were set into steel guides over a course of wooden planks. Six of these horses were mounted on parallel tracks that curved around and up and down dips and hurdles along the length of the course. The horses were gravity-driven, so the momentum generated by each dip would propel riders up the hurdles. Unlike in real horseracing where lighter jockeys are preferable, in the Gravity Steeplechase the heavier the load, the faster you go. Giddy up! By the following summer, the grand three-story Hotel Seashore was completed on a rise behind the pavilion. As the resort was intended to appeal to persons of every means, the first and second floors of the hotel were furnished in heavy mahogany and the less-expensive third floor rooms in respectable oak; those that wished to merely have a day at the beach or an evening of dancing still had access to the other fine facilities. Dr. Lawrence had successfully constructed a true People's Playground--a "source of pleasure and profit to the entire community"--before passing away later that summer. As Ms. Miles noted, the year and half that he devoted to his project, creating the Isle of Palms and linking the islands with the mainland and the city, forever changed the dynamics east of the Cooper. Thank you for your vision, Dr. Lawrence. No longer the Coney Island of the South (that's okay), Isle of Palms is best known for its laid-back lifestyle and gorgeous beaches, with amusements in the form of golf and tennis these days. A short drive to Mt. Pleasant and Charleston, the island is a very desireable place to live and real estate has been booming. At the moment, there are over fifty properties for sale on the island. Interested in the area? Ruthie's been involved in multiple real estate transactions on our beaches in the last few years. Having a family beach house on the Isle of Palms keeps her in touch with everything that goes on over there, so please give her a call at 843.729.1290 if you have any questions about property on the island or other beaches in our area. 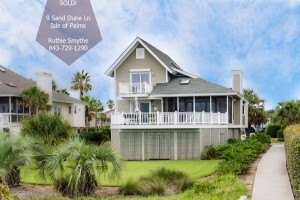 Congratulations, Ruthie, on your recent closing representing the sellers at 9 Sand Dune Lane!